Interpretive graphics honor a university’s rich history and tradition. Along High Street between Woodruff Avenue and the Wexner Center for the Arts lies the old Ohio Field, the home of Ohio State University's first football field before the construction of Ohio Stadium in 1922. MKSK worked in conjunction with landscape architecture firm OLIN (Design Architect) to develop the design concept that delineates the historic site and anchors this north gateway to the university. The commemorative landscape design creates a new defining edge and gateway for campus, integrates seating for study and gathering, and enhances cross-campus connections between two university districts. The landscape references the University’s campus-rich traditions and anchors this north gateway to the campus. A “Scarlet Line” allée of trees creates a unifying gesture marking a clear boundary between the University and City while defining a more comfortable series of open spaces between the street and the buildings. 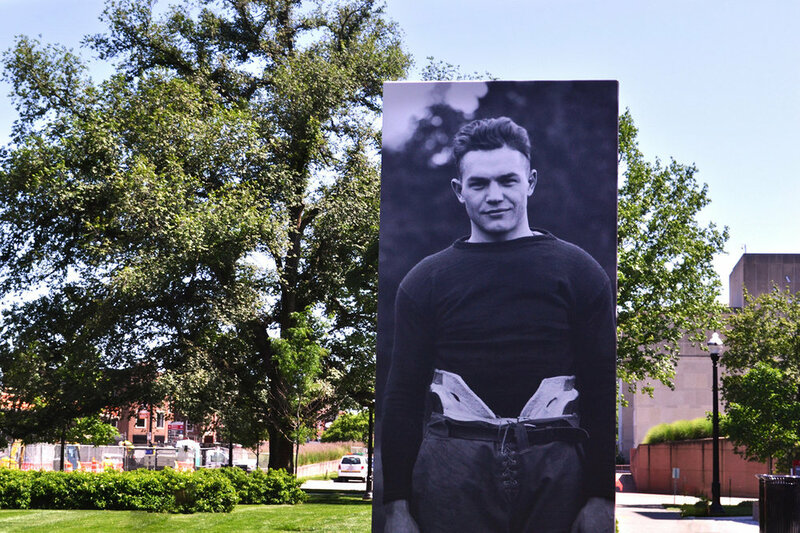 The newly developed North High Street landscape and interpretive graphics pay homage to the memory of the historic Ohio Field where football legend and Columbus native Chic Harley first competed for Ohio State. After implementation of the landscape enhancements, MKSK was asked to develop, design, and implement interpretive graphics to share and celebrate the rich history of the site and enhance the pedestrian experience. 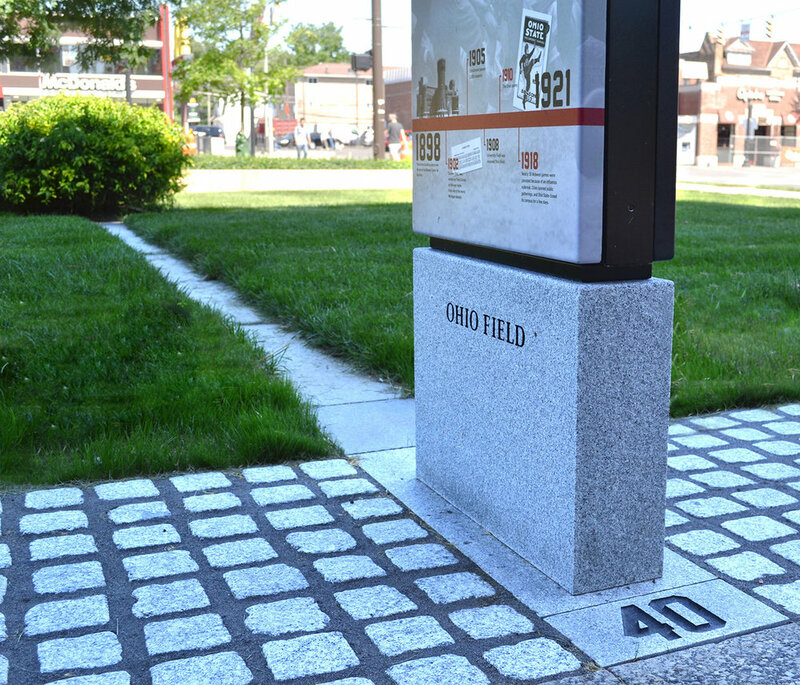 Yardage markers work with the landscape to reveal the original 1898 Ohio Field and the interpretive sign panels at the former 20- and 40-yard-marks utilize stories, historic photos, and life-sized images to give viewers a glimpse into the past. 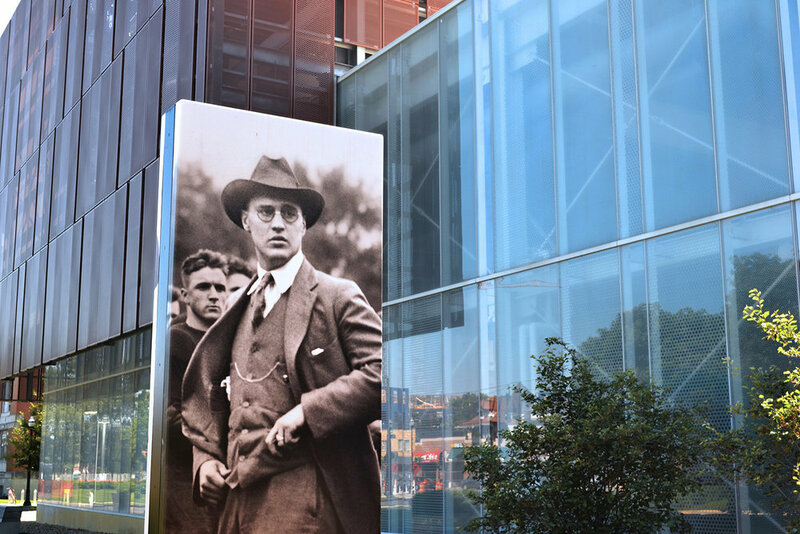 The interpretive panels highlight the significant leaders, athletes, traditions, and spirit that have shaped the University.